OCZ Technology Group, Inc. (Nasdaq: OCZ), a worldwide leading provider of high-performance solid-state drives (SSDs) and power supplies for computing devices and systems, today announced the availability of the Fatal1ty 1000 Watt power supply, the latest high-performance PSU targeted at gamers and enthusiasts that demand maximum wattage, high efficiency, and a modular cabling configuration. Dedicated to delivering premium power solutions, OCZ’s latest PSU was co-developed with twelve-time world champion Johnathan “Fatal1ty” Wendel to meet the specific needs of fellow gamers in performance, stability, and ease of integration to reduce system downtime. Featuring individually-sleeved modular cables, the Fatal1ty Series eliminates unnecessary wire clutter for a cleaner overall presentation and superior airflow in high end systems that are packed with components. Combining a powerful single +12V rail and premium components, the Fatal1ty 1000W balances the needs for both gamer and enthusiast standards with 100% Japanese 105°C capacitors, continuous output at a demanding 50°C ambient temperature, and heavy-duty protection circuitries. Key features include a large temperature and load controlled 140mm double ball-bearing fan with red LEDs for whisper quiet operation, well-regulated electrical noise and ripple, and 80 Plus® Gold certification with up to 90% efficiency at typical loads. The Fatal1ty Series is tested and qualified for the most component-heavy systems with multiple power-hungry drives and video cards by delivering 1KW of continuous power, and offers rock-solid, super-clean DC output and complete array of connectors including detachable CPU, and multiple PCIe, SATA, and peripheral cables. 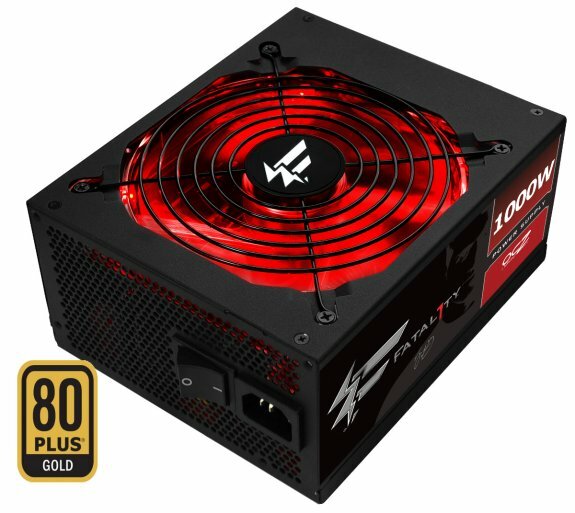 The Fatal1ty Series provides universal input and active PFC (Power Factor Correction) to effectively regulate input voltage and maintain a stable supply of power in an industry-standard ATX form factor to accommodate virtually all computer towers. With sheer power combined with maximum efficiency, the Fatal1ty 1000W is backed by a 5-year warranty.